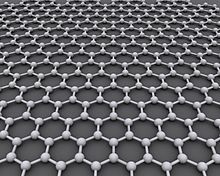 Graphene was seen as the successor material to the silicon based chip. The design is on the molecular scale, so it has less resistance and more efficient in conducting electrical signals. The output of a graphene transistor is precise, and it doesn't make electronic noise. Tests of graphene transistors have shown up to 300 GHz. Graphene so far hasn't shown the ability to act as a semiconductor. Molybdenite, a form of molybdenum disulfide (MoS2), shows more potential than graphene. It uses 100,000 times less energy than conventional silicon transistors, and it has better electronical properties than graphene. Like graphene, molybdenite transistors can be designed on the molecular scale. Molybdenite transistors are cost effective to produce, while graphene is found to be problematic. Molybdenum disulfide can be used as a semiconductor, and it can hold charge-less current. A similar material, molybdenum diselenide (MoSe2) hasn't been investigated into its uses in electronics, but there is speculation of its usefulness. Silicene and germanane, alternate forms of silicone and germanium that are already used in electronics, also have conductive properties that may dramatically improve electronic design. These two materials may be easier to implement into existing technology, because of familiarity with the parent material in electronics. Combining molybdenite and graphene in a transistor is found to be even more advantageous: it allows the transistor to retain its state even when electricity is not passing through it. Molybendite combined with gold nano-particles has advantages properties, and even allow it to act as a gate capacitor. Borophene is a hypothesized material made out of boron. It's structure has been computer modeled, and there is question to whether its properties would be better than graphene's. Fullerone, a pure carbon molecule, may have superconducting properties. Calcium intercalated graphite (CaC6) is graphene coated with a calcium atom also with near superconductive properties. A molybdenite prototype of an image sensor is able to capture more pixels per area, because of its sensitivity and its molecular sizing: this results in better resolution in image capture than was capable before. Graphene can absorb the whole spectrum of infrared light, but it can only absorb less than 3% of it, making it a problem. This page was last edited on 25 March 2016, at 21:15.